With the growth of the hospitality sector in India, hoteliers are making big investments in the sector for future. According to a report titled Hospitality Insights from the Indian CEO-desk, Tier I cities, primarily Mumbai and Delhi, continue to be the most preferred locations for expansion. However, more than one-third of the respondents did indicate a willingness to invest in Tier II towns to capitalise on the growth of domestic travel. 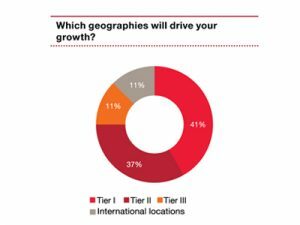 Although most players are not looking for international locations actively, some (especially the larger Indian chains) are open to expanding internationally, provided there is opportunity available.